Amouria takes online jewelry shopping and design, to a whole new level. We have established ourselves online, as the revolutionary leader of handcrafted, custom designed, fine jewelry. 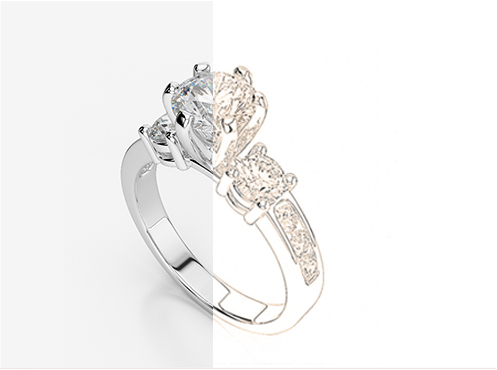 Unlike other online jewelry retailers, we are delighted to fulfill your special requests and even offer 100% customization! Imagine your perfect ring, necklace, pendant, bracelet, or earrings - just a click away. To begin, simply choose your piece and start designing; soon you’ll see your unique piece of jewelry come to life in seconds. That’s us; that’s the Amouria experience. Imagine jewelry shopping without pressure, without judgment, and on your terms. Take your time and explore Amouria’s vast selection and choose from hundreds of styles to find the design that is uniquely you. Once you have selected one of our innovative designs, take a moment to customize it just the way you want it. With a few clicks, you can choose the gemstones and type of metal you want, and create the one-of-a-kind piece of jewelry you envision. Once your piece is exactly the way you want it, make it yours! Your creation will be whisked away to one of our artisans. When it arrives, you’ll discover what it is like to have a custom-made piece of jewelry the meet your precise specifications and vision. It’s luxury at its finest! Amouria was founded on the belief that buying jewelry should be different than buying anything else. Jewelry is the gift we choose to celebrate special occasions and to show someone how impotant they are to us. Our customer care team serves as your personal shopper and concierge, guiding you through our collections, popular styles, unique and innovative designs, as well as shares their vast knowledge of gemstones and metals. Call, chat, or email and you’ll see why our customers rave about everyone in our customer care team. We want you to be absolutely delighted with jewlry you create at Amouria. If you’re not, you can return it.